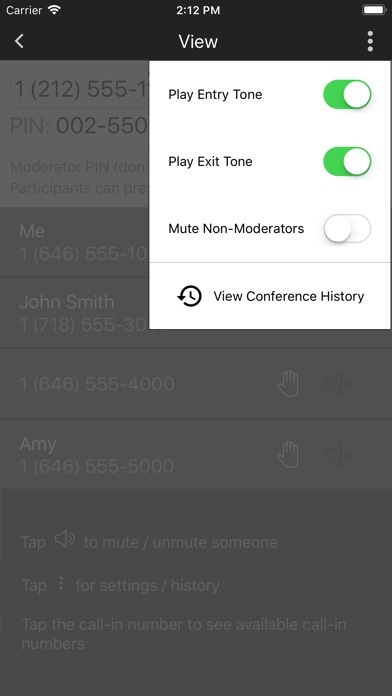 Free conference call rooms instantly, allowing anyone to call in and join your conference. 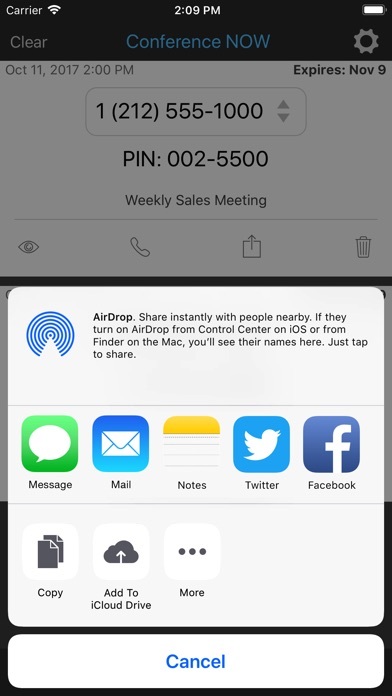 With no signup, conference rooms are available with 1 tap after installing the App. 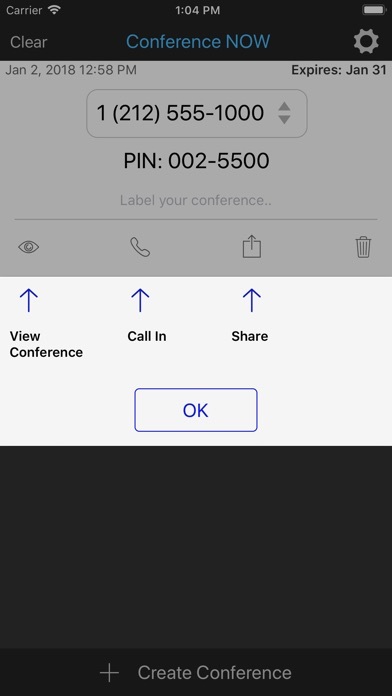 From within the App, Conference NOW allows you to: • Create your own free conference call room • Share the call-in number and PIN with anyone • Call-in from your iPhone (or any phone) • Manage your conference to see and mute participants • See the history of your past conference calls OVERVIEW Conference NOW gives you the ability to create instant free conferences: • Completely Free • No signup required • 1 tap to create a conference • Conference call numbers provided in United States + Canada • 1 tap to call-in and enter PIN on the iPhone • Generate multiple conference rooms • Label your conferences SHARING Share your conference number with anyone from within the App via: • iMessage / SMS • Email • 3rd party Apps (Twitter, Facebook, Skype, etc.) • Copy and paste anywhere VIEW / MANAGE You can view and manage your conference: • See who's in the conference • See who's speaking • Mute / un-mute a participant or all participants • When all participants are muted, others that join will automatically be muted • Call-in as a moderator, and moderator(s) won't be muted when muting everyone • Participants can press * on their phone to raise their hand (use to identify people to un-mute) • Optionally enable contacts access and see the name of a participant if they're in your contacts (data used locally only, we don't have access to your contacts) • Disable entry/exit tones that are played when people join/leave the conference (great for when you have lots of participants) • View your conference call history including dates/times/durations, and information on each participant • Save participants to your contacts, and call a participant back within the app ACCESS NUMBERS Call-in numbers you’re assigned are: • Telephone numbers in the United States + Canada • Can be reached from any phone worldwide • Allow unlimited conference length (some carriers may disconnect calls after 6 to 8 hours, you can always just call back) • Free to call for callers with unlimited calling to the USA or Canada (standard calling rates to the United States / Canada apply for those not on unlimited calling plans) OTHER Since there’s no signup required for Conference NOW, keep the following in mind: • Conference call-in numbers and PINs are deleted automatically 30 days after creation • Every time anyone calls in, your call-in number and PIN expiration is extended by 30 days • Create new conference rooms anytime • There's no signup, email, phone number or anything else required to use the app ••• Like Conference NOW? Please leave a positive review for our app! ••• Comments? Contact us from within settings icon inside the app. ••• See more at our website: http://conferenceNOWapp.com Conference NOW is backed by Callcentric, a telephony provider that’s been providing service to businesses and individuals since 2005. 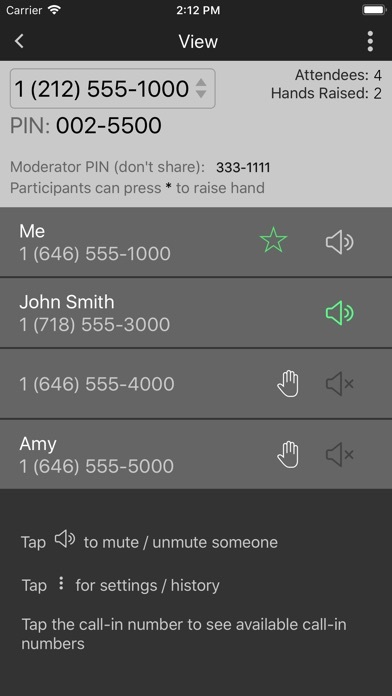 Having issues with muting the entry and exit tones even after turning the sounds of in the app. Other than that a perfect app to use. Great app so far , just one small issue , whenever I update the app it deletes my saved conferences and I have to recreate them and resends them to everyone. 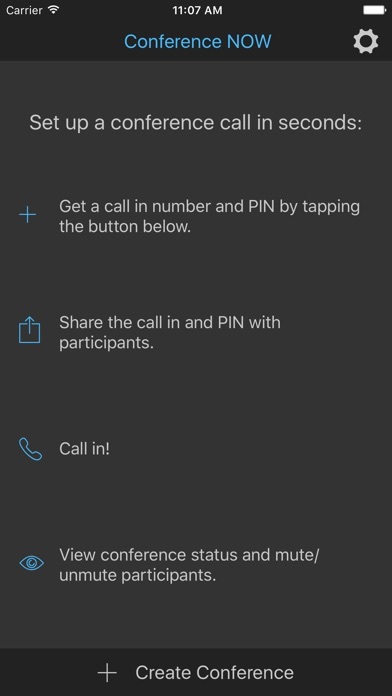 No instructions, it locks up, and it only wants to let me set up a call, not join one. We have been using this for awhile now and so far, we haven’t had any issues. Very clear and easy to use. Love the power this application gives me to communicate with my team. Why do it expired ?